SFBayAreaKoiClub.org - Weaponizing Herpes -What could go wrong? Weaponizing Herpes -What could go wrong? If you've missed the previous posts, then you may not know that the Ausies are planning to release KHV in the Murry-Darling basin in Australia to control unwanted carp. Here is another excellent article that voices serious concerns over the government controlled planned release of KHV. The extermination will begin within years - an especially virulent strain of herpes virus will be gradually introduced to rivers, and the disease will rampage through the carp population, killing as much as 95 per cent. Carp - also known as 'blubber lips' and 'mud sucker' - are those pale-gold, pale-silver creatures that can grow to monstrous size in rivers and creeks. More than 100 years after being introduced into Australia by recreational anglers and do-gooder "acclimatisation societies", it's been decided the carp are causing too much damage, churning up the river bottoms and causing a nuisance, and and they have to go. Essentially Australia is looking to deploy a biological weapon against a bunch of fish. Their mass extermination is being called "carpageddon". This is not the first time we've deployed what's called "biological controls". Maybe the most notorious is the cane toad, which was introduced to control the cane beetle, and ended up ignoring the beetle and driving native species to the edge of extinction. Then there was myxomatosis - introduced in the 1950s, it successfully killed lots of rabbits in Australia. Unfortunately, it then spread overseas, out of control, and killed almost all of the wild rabbits in France and the United Kingdom. The lesson: Using viruses as "biological controls" is playing with fire. 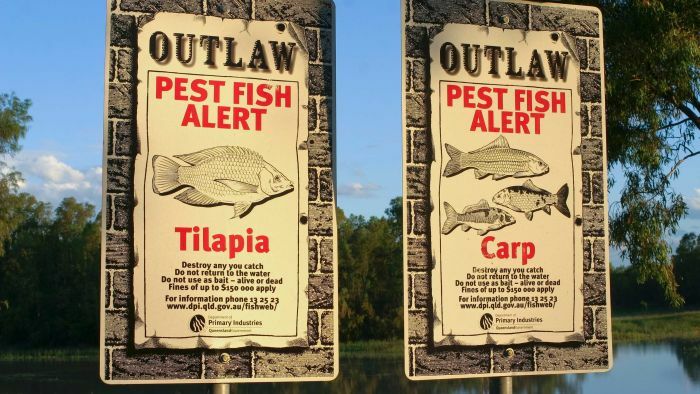 Though the plan has been around for a decade, the idea of giving carp herpes only truly captured the public's attention last year, when the Deputy Prime Minister announced $15 million funding. Barnaby Joyce - who threatened to euthanize Johnny Depp's dogs over non-compliance with biosecurity laws - delighted in talking up the plan during question time, things got a bit weird. "We are afflicted in this nation with these disgusting mud-sucking creatures, bottom dwelling mud-sucking creatures," Mr Joyce said, staring at the Opposition benches. "We on the Coalition are going to make sure we have a healthy river and a healthy economy because we're going to get rid of the carp." But not everyone is as gung-ho as the Member for New England. Hack has spoken with a pet management professor, a carp-fishing tycoon, and a specialist fish veterinarian who doubt government can control the outbreak of the virus and handle the scale of carpageddon. By declaring war on the freshwater pest, they say, Australia may drown under a sea of herpes-disfigured carcasses. How many carp are we talking about? Exactly how many carp are in Australian waterways is not known with any accuracy - estimates range from two to six million tonnes. Let's say there's four million tonnes, that's the equivalent of 100 fully grown humpback whales, or 25,000 bottlenose dolphins. It's true that we've handled feral animal mass exterminations before. The most recent was in the mid 1990s - a strain of calicivirus imported from Czechoslovakia jumped quarantine and killed 10 million rabbits within eight weeks. "The Murray River area stank of dead carcasses because it went through so quickly and killed 80 per cent of rabbits," says Dr Braysher, a University of Canberra professor and recognised expert on the topic of feral animal management. "And that's on land - imagine concentrated in a water system." In the case of calicivirus, the rabbits were left to rot. This isn't an option with carp. "They're going to need lots of people there to collect dead fish because once they die those fish will come to surface and start rotting," says Dr Braysher. As they rot they'll take oxygen form the water. As that happens all other aquatic wildlife that depend on oxygen in the water will die." "If they don't get dead fish out of water it will have major effects." Apart from suffocating the other fish, including native species like Murray Cod, the release of phosphorous and nitrogen will promote blooms of toxic algae. "If you think we have blue green algae blooms now, think about when we have massive fish deaths," says Keith Bell, probably Australia's most experienced carp fishermen. Apart from killing more fish, and stopping people swimming, the algae could poison the water supply of small towns. "Lots of little towns still draw water from rivers," says Keith. "Their filtering system can cope with fish, but not once the fish die and become toxic." OK, just scoop them out. This is only possible if the outbreak of the virus is carefully controlled. If authorities lose control, and too many fish die at once, there won't be enough people to scoop them out. Controlling a virus is very difficult - so difficult Dr Braysher thinks its impossible. "I don't think they can," he says. The carp herpes virus, like all viruses, spreads at an exponential rate. In 1-3 days of its release, the dead carp will begin floating to the surface with bleeding gills, sunken eyes and pale patches on the skin. They suffocate over about 48 hours. The survivors, horribly disfigured, will swim about infecting other fish. Rapid response crews will travel around the countryside netting the dead fish and dumping them in trucks for landfill. The virus will spread through New South Wales, Victoria, and South Australia - in the Murray-Darling Basin, the catchment for Australia's largest river system, it's estimated carp are 90 per cent of the fish biomass. According to Dr Richmond Loh, a fish veterinarian with a particular interest in koi, a species of carp, the virus spreads easily. It can survive in water droplets on a bird's legs, This means it could be hard to contain. Flying upstream, the bird could transport the virus hundreds of kilometres. A single drop of viral water in Lake Burley Griffin, the big man-made lake at the centre of Canberra, right next to Parliament House, could send belly-up an estimated 10,000 tonnes of carp in a single sitting week. "Once the virus is out there there's no going back," Dr Loh says. The virus once hit one of the major recreational lakes in the US and you couldn't go water skiing because you had to dodge all these floating fish everywhere. "The place stunk really badly." Even without birds couriering the virus about, it could still be spread deliberately by humans. It happened with calicivirus - some New Zealand farmers reportedly smuggled it into their own country, to kill the rabbits in their paddocks. "The major problem I see is people who will start picking up fish with the virus and transport them upstream," says Dr Braysher. We can turn them into pet food or make fish fertiliser Maybe not. Last year, when everyone was learning about the carp herpes plan, there was excitement around the idea that the fish could be turned into pet food or fertiliser. There's already a company that turns carp into fertiliser - Charlie Carp - and the owner said the company could even expand production to take advantage of the increased supply. Barnaby Joyce proposed the carp could "take the place of horse manure or something". It turns out it's not so simple. Keith Bell, the fisherman who's responsible for almost all the carp exported from the country in the last two decades, says once the carp begins rotting it can't be used for either pet food or fertiliser. Even if the fish can be collected in time (a matter of hours after they die, he says), the volume would probably overwhelm processing facilities. Carp isn't being used for pet food at the moment, and the fertiliser industry only processes a couple of hundred tonnes per year, according to Keith. "Two to three fishermen keeps Charlie Carp in enough fish for a year," he says. "The domestic human consumption market is 50-60 tonnes a year at a reasonable price. "It's a wasted resource," says Bell, who was exporting a couple of thousand tonnes of carp per year from Australia from the late 90s until last year, when he sold up and moved to Mississippi. "I don't know what the right answer is, but I know this isn't the right answer." Why aren't we exporting more carp, or just eating them? The irony is that carp is one of the most farmed fish in the world. In Europe and China, it's considered good eating. Australia is the only carp-culturing country that hasn't had any reported cases of carp herpes. We're deliberately spreading a virus that other countries are desperately getting rid of - the same way we're trying to get rid of carp. The double irony is carp were originally introduced into Australia for human consumption - either released for recreational fishers or raised in fish farms. "In fish markets in Sydney or Canberra you can buy carp for $6 a kilo," says Dr Braysher. "People who want them will like them and pay big money for them. "It's an attitude thing." Keith Bell says exporting carp from Australia is no longer financially viable. He says restrictions placed on what equipment he could use to catch the fish - restrictions to minimise the bycatch of native fish - made fishing carp too expensive. There's the bind: by relaxing restrictions to boost carp exports, we'll also be getting rid of native fish. Keith closed his export business last year. He says he was the last person to export carp from Australia. Once the virus is released, it can't be removed. From the moment of the release, expected to be late 2018 or early 2019, there will always be herpes in Australian carp. There will also always be carp. It's estimated within 10 years the virus-resistant fish will breed up to 60 per cent of the current population. That means in 10 years time we'll still have a carp problem, and the carp will have a herpes problem. Dr Braysher says the carp are here to stay. "No established pest in Australia has ever been eradicated," he says. He says river health and native fish stocks had begun to decline well before carp began to dominate the Murray-Darling river basin in the late 1960s and early 1970s. Getting rid of carp will create a window of opportunity, before they breed back up, to improve river health and native fish stocks to prevent carp once again dominating the system. To do this, we have to do more than blame the carp, he says. We have to look more closely at politically-sensitive things like agriculture. We need to stop cattle getting into the river and destroying vegetation, destabilising banks and churning sediment." "We all play a part in the degradation of the system, it's not just one individual thing. "The pest is there taking advantage of a modified system." "Treating carp is only treating part of the problem."